OM-AM Series non-metallic fiberglass enclosures are designed to insulate and protect electrical controls and components in both indoor and outdoor applications and are especially well suited for higher temperatures and corrosive environments. 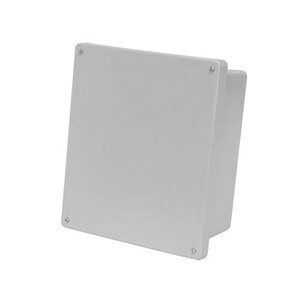 These NEMA 4X (IP66) fiberglass JIC junction boxes feature flat or raised covers with a variety of latching options that allow you to provide the level of security or ease of access needed for each application. Hinged models are constructed with a stainless steel continuous hinge. OM-AM Series fiberglass enclosures are available with the added feature of a raised cover. The cover adds an additional 1¾" of depth to accomodate switches and other devices, and can be used with the optional deadfront panel for maximum configuration within a single enclosure. UL and CSA type 6P, IEC60529 type IP68: Models with flat covers without windows, 14 x 12 x 6 and smaller with 4 screw closure, are submersible up to 24 hours at a depth of 6 feet (1.8m). Flat Cover with Screws- these models are available with "Lift Off Covers" with screws in each corner or "Hinged" on one side with screws on the opposite side. Flat Cover with Latch- these models are available with a hinge on one side with either snap or twist latches on the opposite side. Raised Cover with Screws- these models are available with "Lift Off Covers" with screws in each corner or "Hinged" on one side with screws on the opposite side. Raised Cover with Latch- these models are available with a hinge on one side with either snap or twist latches on the opposite side. Key lock kit for flat cover enclosures, 6 x 6 thru 20 x 16"
Key lock kit for raised cover enclosures, 6 x 6 thru 20 x 16"
Key lock kit for raised cover enclosures with front panels, 10 x 8 thru 20 x 16"